You have several choices. You can log in under your WordPress account, Twitter account, or Facebook profile by clicking any of the icons listed. You can also put in a name (first name or nickname is OK) and an email address (doesn’t have to be a real one) and optional space for your website/blog/Facebook page, etc. If you’d like to be notified of any new comments on the post, click the box and you will receive email messages when there are new comments. You can always “unsubscribe” at a later time. 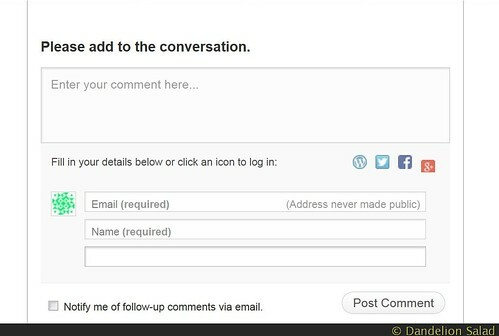 While this information is accurate for most blogs on WordPress.com, some blog owners may change how they receive comments such as having their readers register first. This entry was posted in All Posts News Politics and-or Videos, Blogging, DS editor posts, Lo (posts by me) and tagged Comment, How To, WordPress, Wordpress.com. Bookmark the permalink. I get mad at this site because there is no way of knowing that your comments have been received, I comment some times because of this. I moderate all the comments. If a comment is “under moderation” it states that when the comment is posted, something like “pending moderation”. I also receive a lot of spam and people who don’t say anything but post a link or two or three. All the comments need to be polite (no name-calling or calling for violence) and on topic. I approve 98% of all comments.